Topps returns to San Diego Comic Con 2014 for the first time after 5 years. With the Topps return, they are also bringing a few exclusives along. Topps has created an all-new Garbage Pail Kids character, “Comic Conner,” who will appear on a show exclusive limited edition T-Shirt available for $20. Topps has also created a promo card for their newest GPK character, Comic Conner that will be available on a first come first served basis. There is also an exclusive set of 11×14 jumbo Garbage Pail Kids trading card prints, perfectly suitable for framing, and feature 6 popular “GPK” characters including “Comic Conner.” These jumbo card prints will be priced at $10 each or all 6 for just $40 (while supplies last). With all the excitement over Garbage Pail Kids, Topps will be hosting another Mars Attacks Trading Card Scavenger Hunt. Consisting of 9 exclusive free connecting puzzle cards, the set features all-new art by Chad McCown and is the first official continuation of the 2013 card series, Mars Attacks: Invasion! The first card will be given away FREE at the Topps Booth (4120), with subsequent cards handed out free at a variety of other booths around the show. The back of each card will point convention-goers to the location of the next card in the series (fans can also find the full list of booths by visiting www.facebook.com/MarsAttacks). 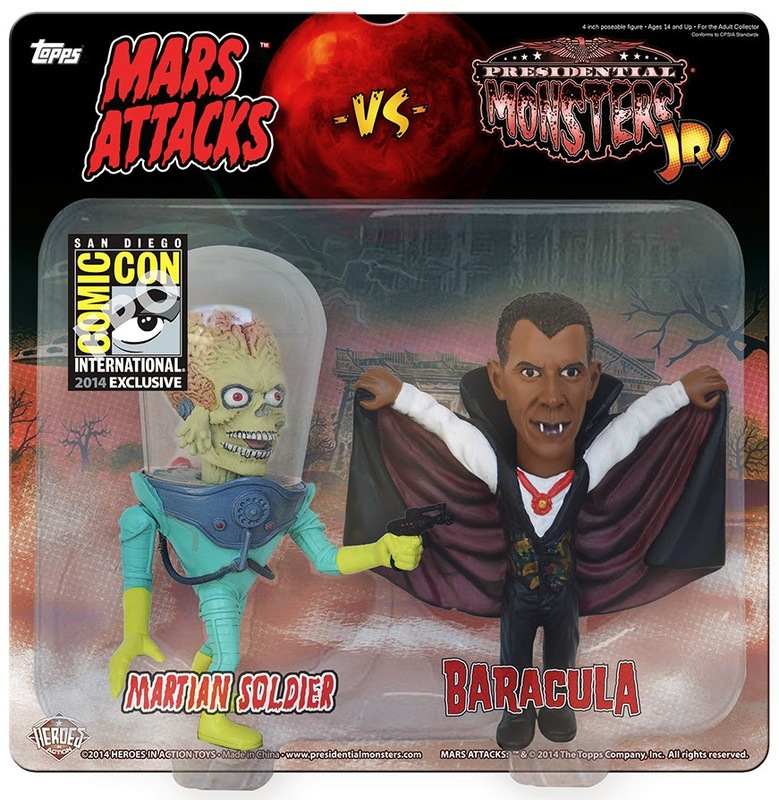 Heroes in Action (booth 3450) will have a Mars Attacks vs. Presidential Monsters 2-Pack featuring a Martian soldier facing off with “Baracula,” one of Heroes In Action’s most popular characters. This 2-pack figure set is exclusive to San Diego Comic-Con. The SDCC Garbage Pail Kids Topps exclusives can be found at Booth #4120!